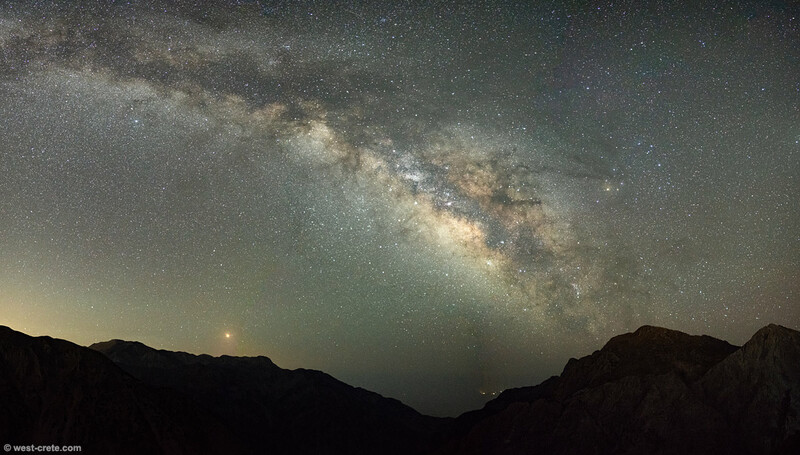 The Milky Way from the terrace of the Kallergi Mountain Refuge. The gorge of Samaria is the dip in the middle of the photo. The lights in there are actually on the island of Gavdos, 55 km away. The summits of Volakias and Gingilos are to the right of the photo. The bright "star" is the planet Mars (right above the summit of Zaranokefala), highly visible at the moment. The orange light to the left of the photo is because of the moon rising behind the mountains.